Metabolism is one of the important determinants of the overall disposition of drugs, and the profile of metabolites can have an impact on efficacy and safety. Predicting which drug metabolites will be quantitatively predominant in humans has become increasingly important in the research and development of new drugs. In this study, a novel micropatterned hepatocyte coculture system was evaluated for its ability to generate human in vivo metabolites. Twenty-seven compounds of diverse chemical structure and subject to a range of drug biotransformation reactions were assessed for metabolite profiles in the micropatterned coculture system using pooled cryopreserved human hepatocytes. The ability of this system to generate metabolites that are >10% of dose in excreta or >10% of total drug-related material in circulation was assessed and compared to previously reported data obtained in human hepatocyte suspensions, liver S-9 fraction, and liver microsomes. The micropatterned coculture system was incubated for up to 7 days without a change in medium, which offered an ability to generate metabolites for slowly metabolized compounds. The micropatterned coculture system generated 82% of the excretory metabolites that exceed 10% of dose and 75% of the circulating metabolites that exceed 10% of total circulating drug-related material, exceeds the performance of hepatocyte suspension incubations and other in vitro systems. Phase 1 and phase 2 metabolites were generated, as well as metabolites that arise via two or more sequential reactions. These results suggest that this in vitro system offers the highest performance among in vitro metabolism systems to predict major human in vivo metabolites. Data on the biotransformation of a new drug represent a critical piece of information used to understand its overall disposition in humans and laboratory animals. Knowledge of the main metabolism routes is important in understanding the main clearance mechanisms, potential pharmacologically active metabolites, potential for interpatient differences in exposure, and drug-drug interactions. It is also critically important to compare the main metabolism pathways of a new drug candidate in humans versus animals, because laboratory animal species are used in safety evaluations. It is expected that major human metabolites are represented in animal safety studies; i.e., that each human metabolite which is present in circulation at 10% or more of the total drug-related material will be present in at least one animal species that is used in safety evaluations at equal or greater exposure levels (Atrakchi, 2009; Robison and Jacobs, 2009; International Conference on Harmonization, http://www.ich.org/cache/compo/276-254-1.html). Such expectations have been described in regulatory guidance and are laid out to ensure that the human metabolites of new drugs have been adequately tested for safety. However, in the typical drug development process, quantitative information on the circulating and excretory metabolites in humans is only available later because the studies needed to gather such information are resource intensive. Many research organizations wait until after a new compound shows clinical promise in a targeted indication before investing in the studies to gain quantitative metabolite profiles [i.e., radiolabel absorption, distribution, metabolism, and excretion (ADME) studies]. Thus, in vitro approaches and systems from which reliable predictions of in vivo human metabolite profiles can be made are highly desired. Comparisons of in vitro metabolism profiles across species can provide an early warning as to whether humans could have a different major pathway of metabolism from animals, and appropriate action can be taken earlier to prevent a delay in the clinical development process. However, in vitro systems can possess some shortcomings when used to predict the total in vivo metabolism profiles in humans. Some systems, such as subcellular fractions, are limited by the complement of drug-metabolizing enzymes present and thus do not provide a complete picture of the metabolism. In other cases, some drugs are metabolized through multiple sequential reactions in vivo before the drug-related material is excreted, whereas the in vitro systems will only carry out one or two sequential reactions. Finally, when attempting to predict whether a metabolite will be present in circulation, other dispositional and distributional properties of the metabolite will have an impact, and presently this effect is difficult to predict. In a previous investigation, human liver microsomes, human liver S-9 fraction, and human hepatocyte suspensions were tested for their success rates in the generation of major human metabolites that had been observed in previously run radiolabeled human ADME studies (Dalvie et al., 2009). Although it was readily demonstrated that major metabolites of many compounds could be generated by in vitro systems, rates of success were generally in the range of 50%. Similar findings were made by Anderson et al. (2009). Thus, there is considerable room for improvement for in vitro systems as applied to the generation of relevant human metabolite profiles. Hepatocytes presently offer the most complete complement of drug-metabolizing enzymes for the generation of metabolite profiles. The typical use of human hepatocytes in metabolite generation involves incubations of new compounds with suspensions of primary cells (fresh or cryopreserved). However, these studies are limited by the duration over which incubations can be run, because metabolic capacity declines after a few hours, and in many cases metabolite profiles of compounds that are either slowly and/or extensively metabolized are inadequate. Hepatocyte culture systems in which the cells are longer-lived have generally not been used for the generation of metabolite profiles because it is well known that the expression levels of various drug-metabolizing enzymes change (Hewitt et al., 2007; Guillouzo and Guguen-Guillouzo, 2008). As a result, unrealistic metabolite profiles would be obtained. A novel micropatterned coculture system has recently been developed, and it has been demonstrated that important drug-metabolizing enzyme expression levels are maintained over extended time periods (24–42 days) (Khetani and Bhatia, 2008). Such a system offers the potential to generate superior human metabolite profiles, because enzyme levels are maintained and the potential exists for lengthy incubation times (i.e., multiple days) to better handle slowly metabolized drugs. The objective of this study was to determine the success rate of this micropatterned coculture system to generate major human metabolites. A set of 27 compounds (Fig. 1), for which metabolite profile data from human radiolabel ADME studies were available, had been previously used to assess the ability of human in vitro systems to generate major human metabolites. This same set was used in the present study, and the metabolite profile data from the micropatterned coculture were compared to the previous data. 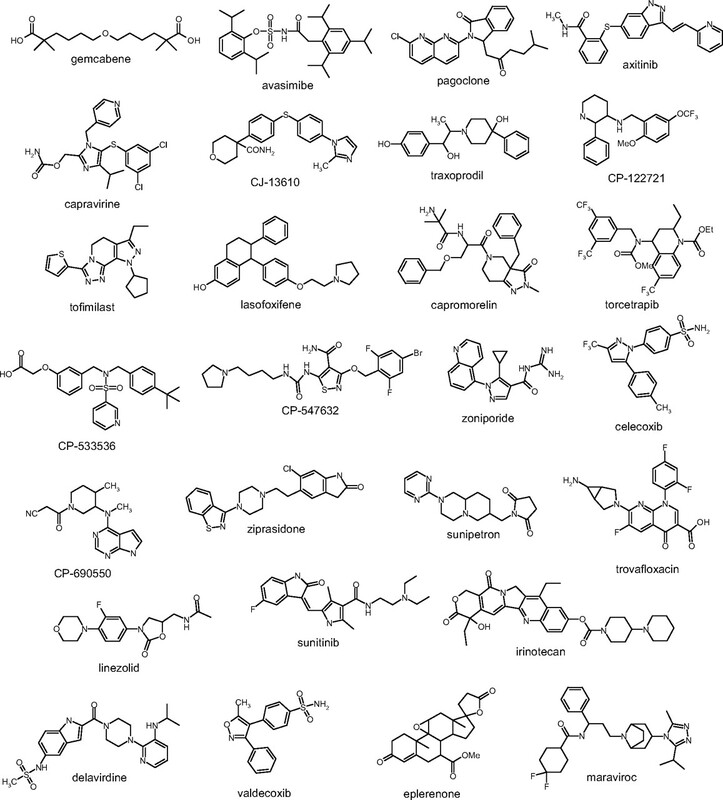 Chemical structures of the 27 drugs used in this analysis. Preparation of Micropatterned Hepatocyte Coculture. Plateable cryopreserved primary human hepatocyte vials were purchased from Celsis In Vitro Technologies (Baltimore, MD) (lot nos. RCP and BOB) and BD Biosciences (Woburn, MA) (lot no. 109). Cryopreserved hepatocyte vials were thawed at 37°C for 90 to 120 s followed by dilution with 50 ml of warm Hepregen-customized and proprietary hepatocyte culture medium (HCM). The cell suspension was spun at 50g for 5 min. The supernatant was discarded, cells were resuspended in HCM, and viability was assessed using Trypan blue exclusion (typically 70–90%). Liver-derived nonparenchymal cells, as judged by their size (∼10 μm in diameter) and morphology (nonpolygonal), were consistently found to be less than 1% in these preparations. To create micropatterned cocultures in 24-well plates, we first produced a hepatocyte pattern by seeding hepatocytes (pooled suspension from the three separate hepatocyte donors) on collagen-patterned substrates that mediate selective cell adhesion. The cells were washed with medium 4 to 6 h later to remove unattached cells (leaving ∼30,000 attached hepatocytes on 91 collagen-coated islands) and incubated in HCM. Stromal cells were seeded 12 to 24 h later to create cocultures (Khetani and Bhatia, 2008). Culture medium was replaced every 2 days (400 μl/well) before incubation with compounds. Two separate studies using all of the 27 compounds were conducted. For each study, micropatterned cocultures containing pooled hepatocytes from three separate donors were allowed 7 days to fully stabilize with respect to liver-specific functions. Cultures were washed to remove serum, and compounds in serum-free HCM (400 μl/well) were added to the cells. At 2 and 7 days, the culture medium was removed from two representative wells and immediately frozen on dry ice. The time points selected were based on an initial assessment of metabolite profiles observed at time points ranging from 4 h to 10 days for six of the compounds. Samples were kept at −80°C until further analysis. Analyses of incubation samples for 27 compounds were performed on a Thermo LTQ system (Thermo Fisher Scientific, Waltham, MA). The system consisted of an Agilent HPLC injector, a HP-1100 quaternary gradient pump, and a HP-1100 diode array detector (Agilent Technologies, Palo Alto, CA) in line with a LTQ mass spectrometer (Thermo Fisher Scientific). The chromatography was performed using a Polaris C18 (4.6 × 250 mm, 5 μm; Varian, Lake Forest, CA) column. The mobile phase consisted of 0.1% formic acid (A) and acetonitrile (B) and was delivered at a flow rate of 0.8 ml/min. The gradient consisted of 5% B for 5 min followed by a linear gradient to 80% B at 50 min, followed by a 10 min re-equilibration of the column at 95% A. The effluent was passed through the diode array detector operated in the wavelength range of 200 to 400 nm followed by introduction, at a split, of approximately 20 to 1, into the source of the mass spectrometer. The mass spectrometer was operated in a positive ion mode and was equipped with an electrospray ionization source. The source parameters for the LTQ were source potential, 4.5 kV; capillary potential, 2 V; and source temperature, 350°C. The mass spectrometer was operated in a data-dependent scanning mode to MS3. The normalized collision energy for the data-dependent scanning was 30 to 40%. In a previously reported study, 27 compounds possessing human quantitative metabolite profile data were examined in three in vitro systems to determine how well these in vitro systems could generate metabolites that represent at least 10% of dose or 10% of circulating drug-related material (Dalvie et al., 2009). This same set of compounds was used in the present analysis of the micropatterned coculture system so that a comparison of performance could be made. The 27 compounds represent a range of structure types and a variety of drug biotransformation reactions (Table 1). In addition, some of the metabolites are the product of a single biotransformation reaction whereas others arise via two or more sequential reactions. For these 27 compounds, a total of 56 metabolites were observed in humans at 10% or more of either circulating drug-related material or excreted dose (or both). In the previous work, liver microsomes, liver S-9 fraction, and human hepatocyte suspension produced 22 (39%), 26 (46%), and 31 (55%) of these metabolites, respectively (Dalvie et al., 2009). The micropatterned coculture system can be incubated much longer than hepatocyte suspensions, and 2- and 7-day incubations of this system yielded 38 (68%) and 43 (73%) of these metabolites, respectively. A list of the metabolites detected in each of the in vitro systems is shown in Table 2. The in vivo metabolites that were not generated were similar across all four systems; there was only one metabolite that was not observed in the coculture system that had been previously observed in hepatocyte suspension. The amount in circulation or excreta are included only if values exceed 10%. There was 100% concordance in metabolite formation between the two separate micropatterned coculture studies. Data for hepatocytes, S9, and microsomes are taken from Dalvie et al., 2009. The data are broken down by categories of metabolites in Table 3. In all cases, the coculture system outperformed all other in vitro systems. For the 39 excretory metabolites, a 7-day incubation of the micropatterned coculture system yielded 82% of these, compared with hepatocyte suspension which yielded 64%. Excretory metabolites that were one step away from the parent drug were generated in 15 of 16 cases in the 7-day incubation, whereas those requiring two or more steps were generated at a lower frequency, albeit at a notable improvement over other in vitro systems. Metabolites arising via functionalization (phase 1) and conjugation (phase 2) reactions were generated at equal frequencies. For some of the compounds, a direct comparison of the micropatterned coculture system and suspension incubations was made using the same pool of hepatocytes. This evaluation was done to ensure that the coculture system was not outperforming the previous suspension incubations by virtue of different metabolic capacities of different hepatocyte pools. Example HPLC-UV chromatograms for linezolid and ziprasidone incubations are shown in Fig. 2. Ziprasidone has four important human metabolites that arise via N-dealkylation, sulfoxidation, reduction, and methylation reactions (Prakash et al., 1997). The micropatterned coculture system generated three of four of these metabolites in good quantity, whereas the suspension incubation yielded just two and in low quantities. For linezolid, which is a relatively slowly metabolized compound (Wienkers, 2000; Slatter et al., 2001), the major oxidative metabolites were not identified in suspension, but both were shown in the micropatterned coculture system. 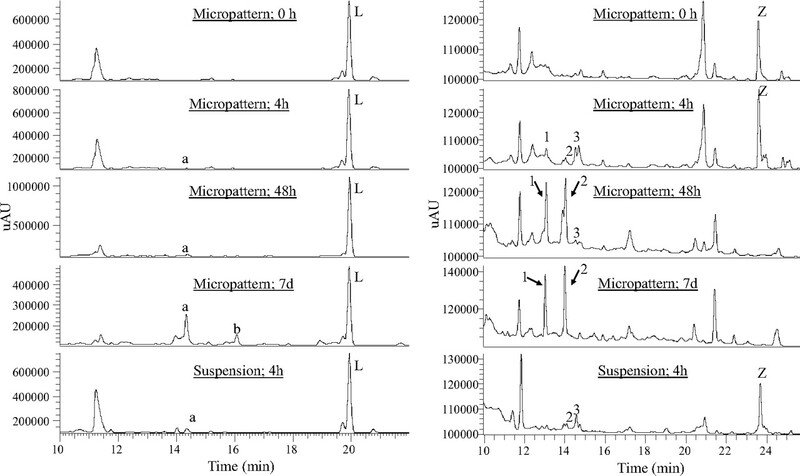 HPLC-UV chromatograms of linezolid (left) and ziprasidone (right) in micropatterned human hepatocyte cocultures (0 h, 4 h, 48 h, 7 days) and suspended human hepatocytes (4 h). L, linezolid; a and b, morpholine ring-opened acid metabolites; Z, ziprasidone; 1, N-dealkylziprasidone S-oxide; 2, ziprasidone S-oxide; 3, S-methyldihydroziprasidone. The generation of relevant human metabolites using in vitro systems represents an important need in the discovery and development of new drugs. There has been an increasing emphasis on ensuring that major human metabolites are adequately represented in animal toxicology studies of the parent molecule (Atrakchi, 2009; Robison and Jacobs, 2009; Smith and Obach, 2009). Identifying a major human metabolite for the first time in a clinical study can cause delays in the development of a new drug, because that metabolite will require attention to assure that its risk has been adequately qualified in preclinical safety studies before studies can continue. Thus, gaining insight into which metabolites may be quantitatively important in humans in vivo prior to clinical studies would be advantageous, because then it can be determined whether these major human metabolites were present in laboratory animal species used to test for toxicity of the parent compound. In vitro metabolism experiments using widely available human-derived reagents (e.g., liver microsomes, S-9 fraction, hepatocytes) have been routinely used to better understand the metabolism of new compounds. However, although these systems are useful, they do not generate all important circulating and excretory metabolites. One of the reasons for this may be that the incubations do not remain active for extended incubation periods. In addition, the determinants of which metabolites will be major in humans in vivo is driven not only by the extent of their generation but also by their individual dispositional properties (e.g., rate of subsequent metabolism, rate and extent of active secretion into excretory biofluids, and distribution into tissues). The micropatterned coculture system offers an ability to carry out metabolism incubations for periods of up to 7 days without changing the medium. Thus, a drug added to this system can be subjected to multiple sequential metabolic reactions. In addition, metabolites generated from drugs that are very slowly but extensively metabolized can be observed in a 7-day incubation. In conclusion, the micropatterned human hepatocyte coculture system offers a superior in vitro approach to generate major human metabolites. Such a system can be used to generate human metabolite profiles that are more realistic than the in vivo profile. Furthermore, the potential exists for applying this system to other types of in vitro drug metabolism experiments that are used to predict and/or understand the human dispositional profile of drugs, such as pharmacokinetics and drug-drug interactions. Investigations into these areas are ongoing. (2009) Interpretation and considerations on the safety evaluation of human drug metabolites. Chem Res Toxicol 22:1217–1220.
. (2009) Assessment of three human in vitro systems in the generation of major human excretory and circulating metabolites. Chem Res Toxicol 22:357–368. (2008) Evolving concepts in liver tissue modeling and implications for in vitro toxicology. Expert Opin. Drug Metab Toxicol 4:1279–1294. (1997) Metabolism and excretion of a new antipsychotic drug, ziprasidone, in humans. Drug Metab Dispos 25:863–872. (2009) Metabolites in safety testing. Bioanalysis 1:1193–1200.
. (2001) Pharmacokinetics, metabolism, and excretion of linezolid following an oral dose of [14C]linezolid to healthy human subjects. Drug Metab Dispos 29:1136–1145. (2009) Metabolites in safety testing (MIST): considerations of mechanisms of toxicity with dose, abundance, and duration of treatment. Chem Res Toxicol 22:267–279. (2000) Oxidation of the novel oxazolidinone antibiotic linezolid in human liver microsomes. Drug Metab Dispos 28:1014–1017.